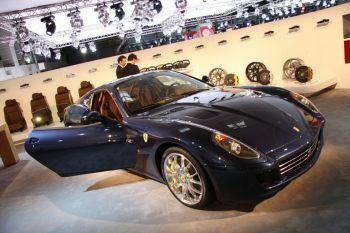 At the Paris Auto Show as Ferrari has announcing an extension of the One To One Personalisation Programme, which debuted last March solely for the 612 Scaglietti, on to the 599 GTB Fiorano, and has recreated the Atelier on the stand. 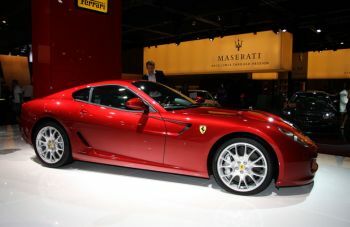 One of the main areas of interest to 599 owners using the One To One Programme will be exterior colours, with not just an enhanced ability to produce unique body colours, but also a new range of wheel rim finishes and colours. 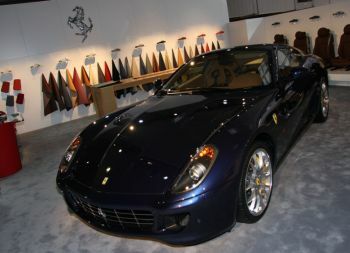 The 599 GTB Fiorano’s interior may now also be personalised in Terra Bruciata and Maculato Opaco leather. Nor does the leather have to be a only a particular colour, with leather finishes such as ‘maculatura’ (a light ‘leopard skin’ speckling), ‘goffratura’ (a rough embossed-type finish) and ‘sporcatura’ (fine, dark speckling for a ‘distressed’ look) also available. With regard to onboard equipment and finish, Alcantara is now available for carpets and boot trim (the boot may also be trimmed entirely in leather, if preferred). Since it opened in Maranello four months ago, the Atelier has been involved in the styling of no less than bespoke 20 612 Scagliettis. Historic and out-of-range colours, such as Grigio Ferro Met and Rosso Monza, have proved particularly popular. The new interior shades have been much sought after too, specifically the speckled matt finishes. Almost all of the clients that have chosen this finish have also requested cream stitching for the Ferrari Prancing Horse on the headrest. As at the Geneva International Motor Show in the spring, Ferrari has recreated the Atelier for its stand at the Paris Show too. This is an area to which clients can come to work out every last detail of their 599 GTB Fiorano on the basis of their own personal needs and tastes. Dedicated Ferrari staff are on hand to work with clients at each step of the way. Naturally, all of the various personalisation options on offer will ensure that the intrinsic character of the car is unchanged and will not in any way impinge upon the car’s active or passive safety systems.